A couple of months ago, the MOMS Club I belong to had a very cool tip in the monthly newsletter. One of the other moms had taken a few children’s nutrition classes and had one perfect tip for the rest of us: the Snack Tray! Literally this tip has saved my sanity since I started using it. The premise is that children are natural grazers and we try to force them to sit through three meals a day and rarely offer snacks in between. Kid’s stomachs are super small therefore they require less food more often then an adult. Enter the Snack Tray. The nutritionist suggests using a muffin tin with either 6 or 12 bins, I use one with 12. Then fill each bin with healthy, nutritious finger foods that kids can eat throughout the day. Since each bin is about ½ cup you know your kids are getting great serving sizes of fruits and veggies! I keep the tray on an ottoman in the kid’s path so they see it all day. I rarely refill any of the bins because I want to make sure they are getting good servings of each food group. Since I started using the Snack Tray most tantrums and meltdowns have disappeared, particularly with Hayden. I never have a kid begging for something to eat while I’m making dinner and both kids sit and eat dinner when it’s served. Amazing! I’ve had such a great response from my kids that I just had to share with you how much this simple trick has saved me from insanity. 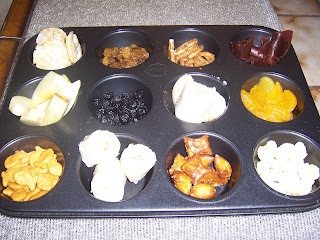 This tray is especially wonderful when we have play dates, I no longer have the visiting kid asking for snacks and then saying they don’t like what I’ve prepared… they just snack all day on the nutritious food I’ve put out. I try to add new and interesting stuff, some work, some don’t. I once put in Kashi Ranch crackers and watched as both kids dug in… then Hayden brought all of them to me and said, “Trash.” But both kids always try the newest item first. I love it! If you try this, let me know what you think! I love this idea. I'll have to give it a whirl. Do you get fights over, say, Jack wants ALL the yogurt raisins and won't share them with Anna or that kind of thing? I like any idea that makes kids feel like they are in control when we really are. This is great. That is the one thing that is hard for me when Graedon gets home from school. He is always hungry and it is usually 3:30 we have homework to do and I have dinner to make so I don't have time to mess with making a snack. If I could jusst get it together when I make my lunch ha ha most days that doesn't happen until late in the afternoon... Anyways Kathy Kudos on the snack inspiration. I love this Kathy! Absolutely brilliant. I'm going to the grocery store right after I do yoga to load up on some of your listed snacks. You may have just saved my sanity! So out of the political loop. My painter (AKA my husband) is about to shoot me.